The Skinny: Though totally inconsequential and occasionally manufactured, Swing Girls is delightful stuff that entertains without insulting. The story may seem undeveloped and even inconclusive, but director Shinobu Yaguichi and company hit all the right notes. If you loosen up and swing, this movie will reward you. From the makers of Shall We Dance and Waterboys comes Swing Girls, a feel-good comedy about a bunch of girls who form a group to perform big band jazz. That's it. Forget big emotional clinches, family issues, or even any real teen romance; this is a movie about girls who play the sax, trombone, trumpet, and assorted other instruments that you might remember from high school. 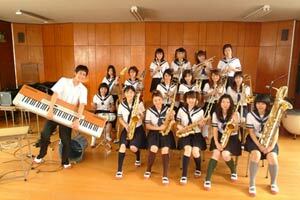 Very little else happens in Swing Girls besides the girls picking up the instruments and learning how to play them. Most of the girls are types, some are barely glimpsed, and yet everyone bands together to perform some inspirational jazz in a loaded "battle of the bands" finale. Does this sound like a good movie? Well, formula be damned, it is a good movie! Juri Ueno stars as Tomoko, a sometimes mouthy, but wholly average high schooler stuck in remedial math for the summer. Tomoko and her pals are given the chance to escape class (taught by Naoto Takenaka of Waterboys and Shall We Dance) to deliver lunches to the school's brass band, currently playing at an important away game for the school's baseball team. Unfortunately, fateor the lazy, self-involved antics of teen girlsthrows the band a curve ball; the girls are late delivering the lunches, which all spoiled thanks to the heat. Even though the baseball team wins, all 40-plus members of the band get hospitalized, leaving only dorky Takuo (Yuta Hiraoka) unscathedand he was looking to quit the team anyway! 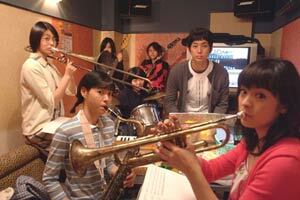 The school still needs a band, so Takuo corrals Tomoko and her pals as replacements. There are only sixteen of them, which is too few for a regular brass band, but perfect for a big band. Presto, the Swing Girls (and a boy) are born! Swing Girls is not a complex film. Aside from having a completely simplistic narrative, each of the starring girls is a defined type. Tomoko is the aimless leader of the bunch, who discovers something worth caring aboutnamely jazz. Pal Yoshie (Shihori Kanjiya) is boy-crazy, while beefy Naomi (Yukari Toyoshima) is given to open-mouthed stares and concern over her weight. Sekiguchi (Yuika Motokariya) is the amusingly shy one of the bunch, but her character charms thanks to her apparent natural talent for playing a brass instrument. The motley bunch stinks it up initially, but perseveranceand the magic of time dissolvesallows them to improve rather quickly. Soon they're charming locals and audiences, which may seem a bit too quick to be believable. However, if you're watching, you'll likely be charmed too. How did they do that, anyway? The answer: with astoundingly keen commercial instincts and a welcome absence of guile. The road seems insurmountable: many of the girls are barely developed, the filmmakers take easy shortcuts to get the girls on the same page, plus they manage to leave nearly all their subplots hanging, AND there's really no closure. However, closure and verbalized epiphanies are not necessary for Swing Girls. One reason is the film's droll, deadpan sense of humor, which manages to be funny without becoming cloyingeven when slapstick gets invoked. The kids may all be types (down to mopey, dorky Takuo), but they're presented matter-of-factly and without an overemphasis on their defining quirks. 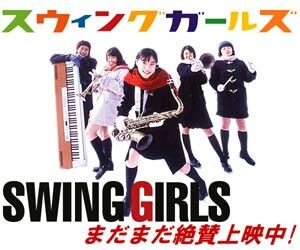 The world of Swing Girls is deadpan hyper-realistic, in that everyone is off-kilter and a little bizarre, but not so much that they cease to be familiar. Plus, nobody in the film is ever made out to be more important than the "Girls Meet Jazz" hook. For an inconsequential fluff-fest, Swing Girls possesses a deceptively tight focus. The girls also go through an actual process of learning jazz onscreen, which proves both interesting and even infectious. The girls may sound terrible at first, but they slowly learn how to be real band members, and when they finally discover their rhythm, it manages to be a revelation to both the girls AND the audience. The girls find jazz in everyday life, and the even though it's hard to buy their quick ultra-improvement as musicians, the moment is felt. The audience gets to share in the girls' minor growth and discovery, and that the director can convey that is half of the film's charm. Yaguichi draws the audience along by not overdoing anything. Basically, we follow the girls as they gain an interest in jazz, struggle to start their band, struggle to make the competition, and struggle to perform before a whole mess of people. The struggles are relatively minor and even random, and the solutions aren't much to write home about either, but nothing is shoved down the audience's throat. That, in itself, is an accomplishment.